Victor David Brenner’s design for the Lincoln Cent broke new ground by placing the image of an actual person on a coin made for circulation. In another break with tradition, Brenner placed his initials near the bottom of the back of the coin. Despite their small size, the letters V.D.B. were obvious enough to created an uproar with the public and Mint officials, who immediately demanded their removal. This was done later in 1909, resulting in the creation of four varieties: 1909 (with and without V.D.B.) and 1909-S (with and without V.D.B.). The 1909-S V.D.B. is the rarest of the four varieties. In 1905, President Theodore Roosevelt commissioned the famous American sculptor and artist, Augustus Saint-Gaudens, to prepare designs for a new Small Cent. Initially, Saint-Gaudens’ design for the obverse featured a Flying Eagle motif similar to James Barton Longacre's designs on the Small Cents of 1856-1858. However, this design was scrapped in favor of a head of Victory in profile wearing an Indian headdress. Saint-Gaudens and Roosevelt liked this design so much that they used it on the 1907 $10 instead of on the Cent. Saint-Gaudens died of cancer before making any more progress on the Cent design so it was not until 1909 that Victor David Brenner created the famous bust of Abraham Lincoln with which we are all so familiar today. In fact, the 1909-S V.D.B. 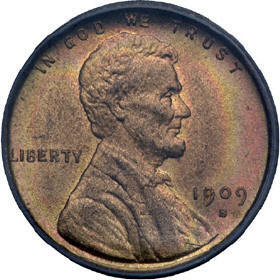 Penny has long been considered one of the key dates in the series, filling the dreams of collectors young and old. While the mintage of 484,000 may seem high compared to many other American rarities, one must understand that there are millions of people who collect Lincoln Head Cents. 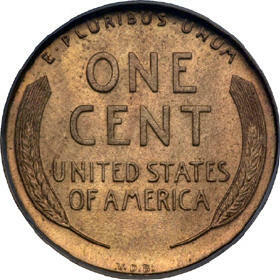 There are simply not enough 1909-S VDB Pennies to satisfy all of the collector demand.